Douglas Morin Sr. (left) talks about his son Doug Jr. with family friend Joshua Boisvert at the Morin family home on Monday. Maine State Police say the younger Morin is a homicide victim. 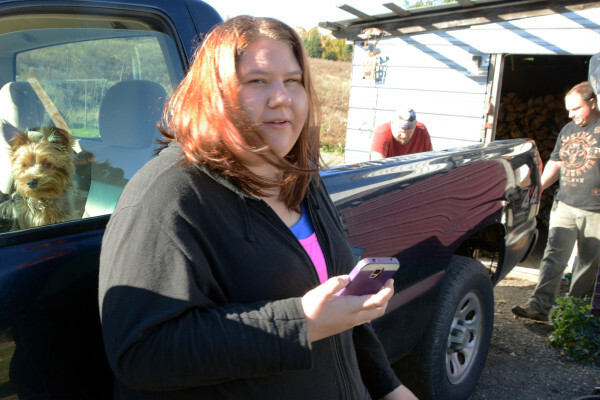 Danielle Morin, 22, talks about her brother while her father [left] and family friend Joshua Boisvert grab firewood from the back of the family pickup truck on Monday. SHERMAN, Maine — State police are investigating the death of Douglas Morin, 31, of Oakfield as a homicide. His body was found in a vehicle on PD Road, which is located off Cold Brook Road, on Sunday. The cause of death is not being released, but the medical examiner’s office determined the death to be a homicide, Maine Department of Public Safety spokesman Stephen McCausland said Monday afternoon in a news release. Morin’s body was found at about 10:30 a.m. Sunday. Detectives have been working on the case since the body was discovered, McCausland said. Family members interviewed at their River Road home on Monday said they didn’t know who would want to hurt Morin, or why. His father, Douglas Morin Sr., said he last saw his son at about 7:30 a.m. as the latter was headed out the door. “I don’t know why he got murdered,” Douglas Morin Sr. said, describing their Sunday morning exchange as uneventful. “He said, ‘I will see you in a little bit. I have to run some errands.’ That was it. He’s 31. He doesn’t need my permission for anything,” the 54-year-old Morin added. “Then at about 2 p.m., my daughter got a message on Facebook alluding to the fact that he was gone, but we did not know if it was for real until” a state police patrol sergeant came to their door hours later with the horrible news. State police detectives couldn’t provide much insight into what happened. A criminal record check on Morin on Monday afternoon appeared to support the family’s account. It lists only a Class D domestic violence assault charge for which Morin pleaded guilty and served seven days in jail. McCausland could not confirm on Monday whether Morin was the same person named by at least one New Jersey news outlet as having been arrested in early February 2015 in Carlstadt, N.J., for allegedly making methamphetamine. Dated Feb. 3, 2015, the article lists a Douglas Morin, 30, of Oakfield, Maine. “I have no information on that,” McCausland said. Morin, family members said, was a logging truck driver who was due to return to work on Friday. He had been laid off for about a year and was looking forward to getting back behind the wheel. A deer and bird hunter, fisherman, occasional kayaker and avid mechanic, Morin loved engines of all sorts. He also loved riding his Harley-Davidson motorcycle and doted endlessly on his 3½-year-old niece Lillian. When Boisvert’s father slid into a snowbank and wrecked his son’s Pontiac Sunbird back when the boys were in high school, Boisvert dropped it off at the Morins’ home, sure it was unfixable. But his friend returned it to him the same day, Boisvert said. Morin was also, his father said, looking forward to something that, tragically, now he will never see — his birthday. Morin would have turned 32 on Oct. 25. Correction: An earlier version of this story misidentified the road where the man’s body was found because of incorrect information provided by state police.